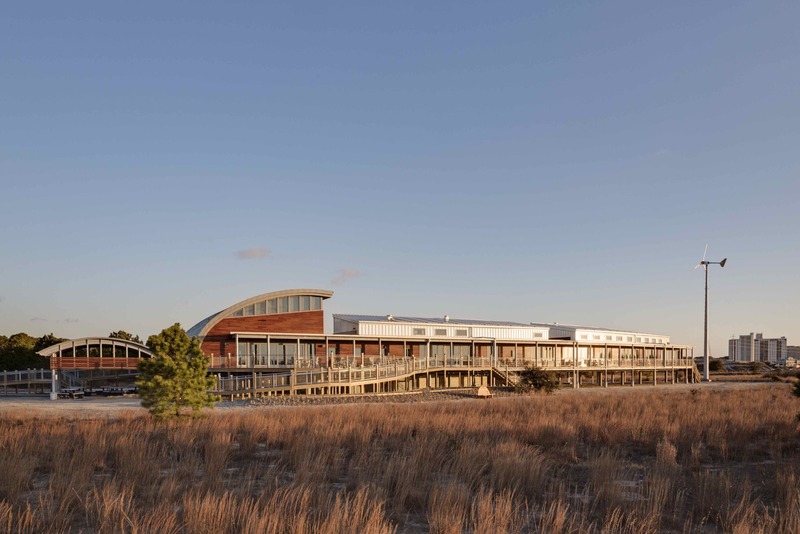 The Chesapeake Bay Foundation's Brock Environmental Center in Virginia Beach, Virginia. Hourigan Construction served as general contractor. We cannot emphasize enough the team-wide cooperation and communication that was required to successfully create a project like the Brock Environmental Center. The Chesapeake Bay Foundation today announced the award of the prestigious Living Building Challenge (LBC) certification to the Brock Environmental Center, a 10,000-square-foot facility located on the Lynnhaven River at Pleasure House Point in Virginia Beach, Va. For a construction company, designers, and engineers, achieving this certification required going outside of the typical toolbox for new building methods, renewable technologies, and sustainable materials from around the world. The LBC certification, given by the International Living Future Institute (ILFI), is the world’s most rigorous and ambitious performance standard for buildings. 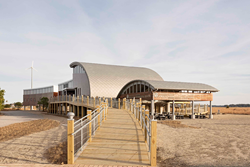 The Brock Environmental Center is one of the only commercial buildings in the world to be LEED Platinum, fully LBC certified, and to create drinking water from rainwater. 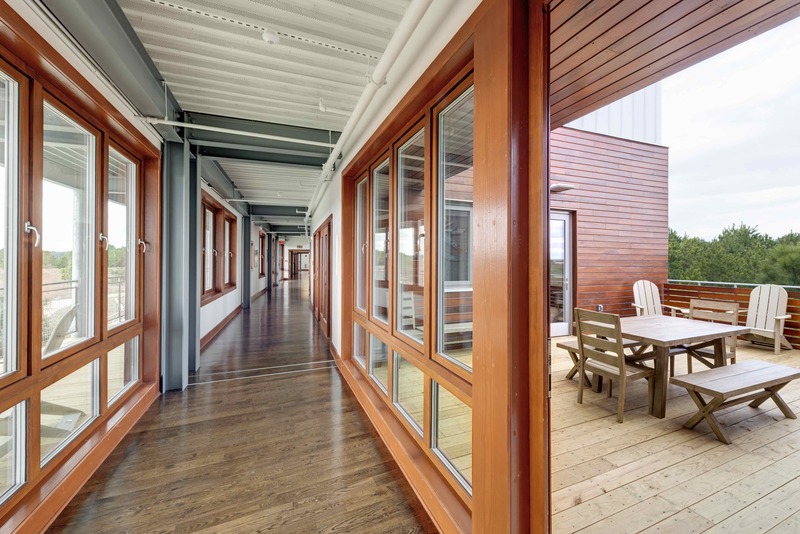 With an emerging sustainable construction division, Hourigan Construction served as general contractor for the Brock Environmental Center, a net-zero energy, water, and waste facility. Partners included engineering and design firms SmithGroupJJR, Skanska, WPL Site Design, and JHarrison Architects. The Living Building recognition means that the Brock Center is fully certified across each of the Challenge’s seven “petals,” which include place, energy, water, health, materials, equity and beauty. Each petal offers a series of requirements and sustainable construction challenges that the building must attain to be certified as a Living Building. Rainwater collection and treatment systems, for collecting rainwater to create drinking water and for use in sinks and showers (greywater). Renewable energy technologies, including photovoltaic solar cells, two wind turbines, geothermal wells, heating and cooling retention, rainwater usage, and net-zero carbon dioxide emissions, that each contribute to the facility being a net-zero energy building. Reclaimed and salvaged exterior and interior materials, such as sinker cypress wood siding, fallen oak trees for benches, and old school gym bleachers for interior trim, salvaged ceramic, and champagne corks are repurposed as knobs. For full details of the Brock Environmental Center’s sustainable construction and engineering elements, visit the news section of the Hourigan Construction website or cbf.houriganconstruction.com. Hourigan Construction is a full-service pre-construction and construction company serving a variety of markets including federal, healthcare, institutional, higher education and commercial. The firm holds both a Virginia Class A License and a North Carolina Unlimited License. Hourigan Construction operates throughout the Mid-Atlantic, with offices in Richmond and Virginia Beach. For more information, visit houriganconstruction.com. A fact sheet about the sustainable construction and engineering elements of the Brock Environmental Center.Learn more about the construction, engineering, and renewable technologies supporting the Brock Environmental Center, one of the most recent and rare Living Building Challenge certification recipients. 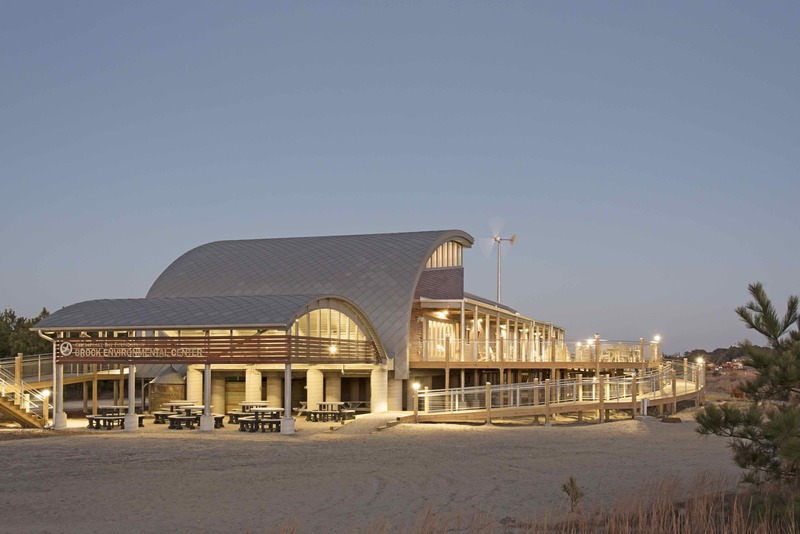 The Brock Environmental Center in Virginia Beach has achieved net-zero energy consumption and zero water-use and runoff.The facility sends power back to the electrical grid through renewable technologies including photovoltaic cells, wind turbines, geothermal wells, heating and cooling retention, rainwater usage, and net-zero carbon dioxide emissions. The facility is one of the only commercial buildings in the world to be LEED platinum, receive a full Living Building Challenge, and create its own drinking water from rainwater.Pre-construction and planning took one year to uncover materials and technologies that could be used to meet the water demands. 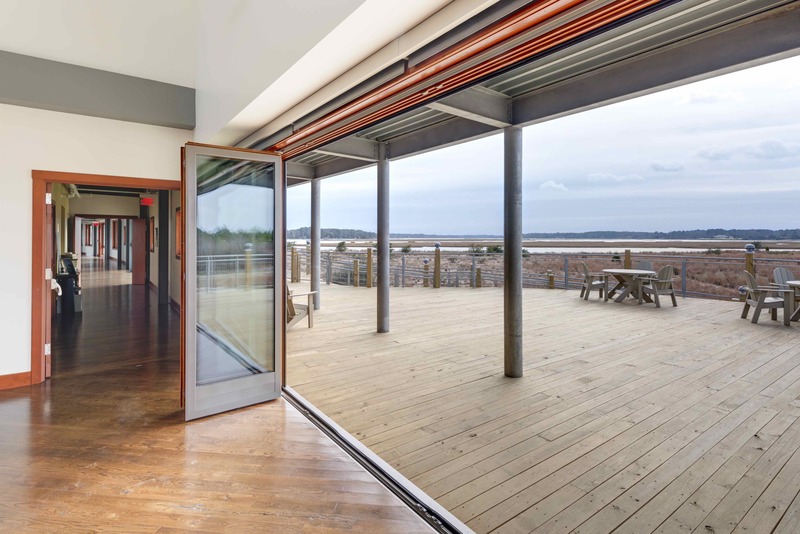 Site development focused on preservation of the local ecology, and includes a boat pier with floating dock and an open-air education pavilion.The site, filled with walking trails, allows visitors to feel a connection to nature simply by sitting on the building’s wraparound porch. As many design elements as possible are composed of recycled, reclaimed or salvaged materials, minimizing the carbon footprint and maximizing the retention of natural resources.Old school gym bleachers were salvaged for interior wood trim. Reclaimed maple gymnasium wood flooring is used throughout the entire facility. Salvaged ceramic tile is used in restrooms, and old champagne corks are repurposed as knobs.